Gauge works with most OEM and aftermarket oxygen sensors (does not work with wide band O2 sensors). If sensor is needed, use #105-2244, which includes sensor, weather pack harness, and weld fitting. Gauge has no provision for lighting. Auto Meter's legendary, classic Sport-Comp Gauges have reinvented performance with their accurate and precise readings. These gauges have a clean, easy-to-read design with traditional incandescent lighting that is highly visible in day or night driving. Each highly-durable gauge can withstand the rigors of competition and is well-suited for use with any race car's electrical system. 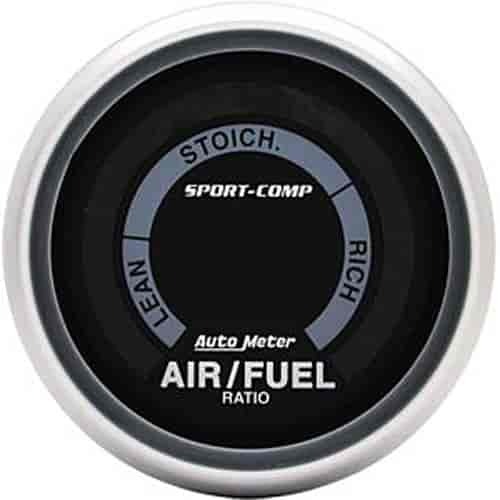 Sport-Comp gauges are a huge part of why Auto Meter is the leading aftermarket gauge supplier on today's market. Auto Meter Sport-Comp Elite Digital Gauges offer superior high-end performance instrumentation with the option of two separate readings and gives you the ability to toggle between the two. Using buttons on the front of the gauge you can easily assign parameters for comparison. By programming warning points, the gauge display will blink alerting you to critical readings.